Conair Company brings lots of hair styling tools in the market. Hot Rollers are one of them. They make different hot rollers set with different style and configuration. Conair Compact Hair Setter is one of their nicest inventions for Bouncy, Sparkly & Volume Curls with multi-sized rollers in a compact box. One can easily get different types of safer & quicker styles with Conair Compact Hair Setter. If you are searching for tangle-free curls with a hot roller set, Conair Compact Hair Setter could be a good choice to try! Read our article to have a clear concept of this product. You can get luminous bouncy curls with Conair Compact Hair Setter whatever your hair type is. This product comes in a compact size box with a nice plastic cover. This product includes multi-sized 20 rollers in 3 assorted sizes and pin holder place. And also different color-coded 20 steel pins. This hair setter runs in 110V with US plug-in system. An indicator light is included with the box for showing the on/off option of the hair setter. The heating rod of the hair setter is long enough that the rollers need only a few minutes to get hot. The price and the comfy compact size with performance give this hair setter really a good position in the marketplace! 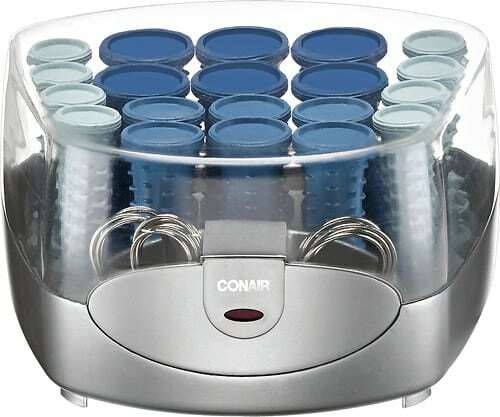 Conair compact setter is totally designed with plastic material. Rollers, heating tray, cover all the things are made of plastic except the rollers’ pin. All the things of the product come in a plastic compact box which is only 8.7 inches (22 cm). With 20 multi-sized rollers, its weight is only 2.6 pounds. The hair setter box is brilliantly designed that no need any extra heating tray or pin holder. All the things can be easily managed in a nice box with a clear plastic lid. 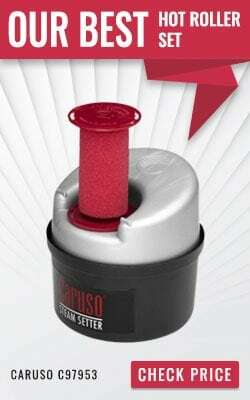 The rollers are designed with plastic material. Some plastic spikes are included with every roller. Hairs do not get tangled free and bouncy curls are nicely set because of this type of design. Grip patented design of the rollers hold the hairs quickly and securely for a diversity of technique. 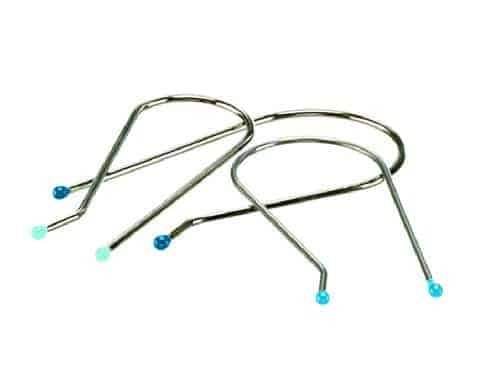 20 color-coded steel pins are included with the hair setter according to roller size and color. Pins can be stored in the allocated place of the box. 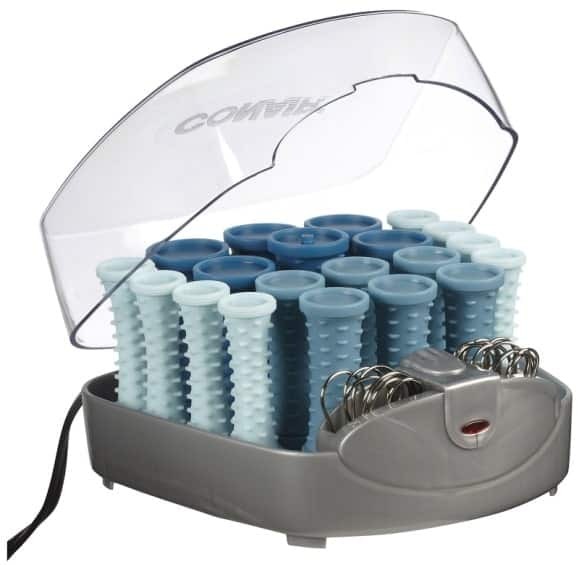 Place all the rollers into the heating rod and pins into the pin holder of Conair Compact Hair Setter. Wait for few minutes (1 or 2) to get the proper heat for the rollers after plug-in. Set all the rollers into the head; wait for 10-20 minutes to set the curls properly. 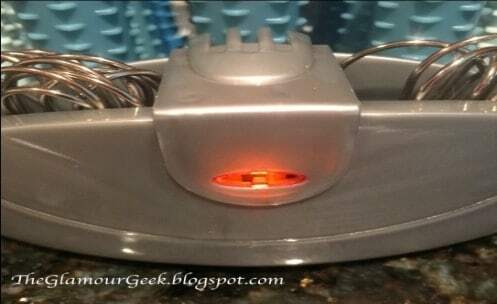 Use hair dryer/hood dryer if you need early hair curls! Heating rods are enough long up to the rollers’ size that each roller gets enough heat from them. Just plug-in the hair setter into the electricity, the indicator light of the box will be turned ON. When you’ll get the exactly heated rollers, unplug the setter. The indicator light will be turned OFF. Conair Compact Hair Setter supports only 110 volts and US plug-in system. For different electric plug outlet than the US, it needs an adapter. For a different voltage system, this setter needs a converter. 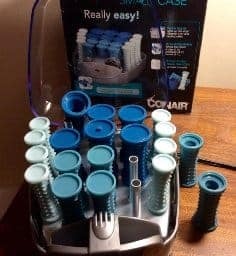 Conair Compact Hair Setter can be applied on all types of hair. So having any types of hair is not a problem! 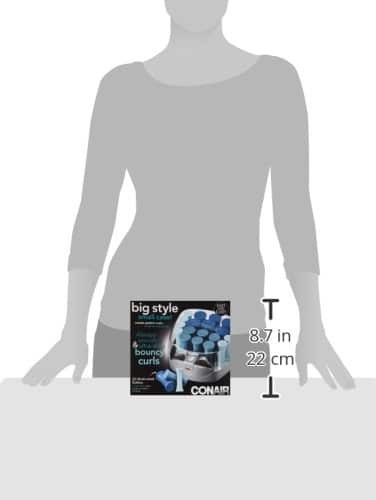 Conair Compact Hair Setter has 3 types of rollers. By using those rollers, one can easily get their desired curling style. Small rollers can be used for tight curls, medium rollers are for medium and large are for loose curls. Section hair according to roller size for better curls! Need adopter & converter for those countries if plug-in outlet & voltage do not match the product’s one. No auto switch for heat-up and heat-end. Plastic setter could be melted if overheat is given accidentally. The weight of this setter is a little bit heavy, though it contains 20 rollers! If this model is not perfect for you, you can view our Conair guide to see other popular products. Do not curl your hair with very wet hair. Otherwise, your curls will look damp & live less. Use hairspray or serum before rolling your hair with the roller. It will set your curls nicely and gives extra shine. After removing all the rollers from the head, use fingers to set the curls. Do not comb/brush. Always clean your hair styling tools properly after every use. It will keep them well for long life. Product Description: Conair Compact Hair Setter is one of their nicest inventions for Bouncy, Sparkly & Volume Curls with multi-sized rollers in a compact box. One can easily get different types of safer & quicker styles with Conair Compact Hair Setter. 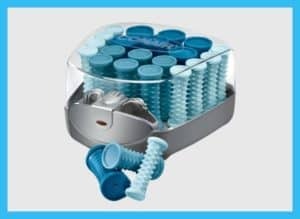 Conair Compact Hair Setter comes with different types blue color rollers in a beautiful properly decorated compact box. It has all the capabilities like a professional touch. With the reasonable price, it’s a nice curling hair setter that you don’t need to go for a salon to curl your hair!